Industrial packaging specialist Greif is delighted to be celebrating 90 years of production at its Hamburg facility. Founded in 1928 by Dutch entrepreneur Bernard van Leer, the Hamburg plant started out as a manufacturer of steel drums for the oil industry and asphalt drums for tar products. Today it is a specialist producer of large steel drums and tight head intermediate steel drums for the global oil and lubricants industry, manufacturing more than one million large steel drums and 700,000 intermediate steel drums annually. The Hamburg plant continues to lead the way in new product development, designing and producing steel drums to exacting standards with a range of specialist features and accreditations. Ongoing investment in innovation, aligned to a strong focus on customer service has enabled the Hamburg plant to excel during its 90 year history. 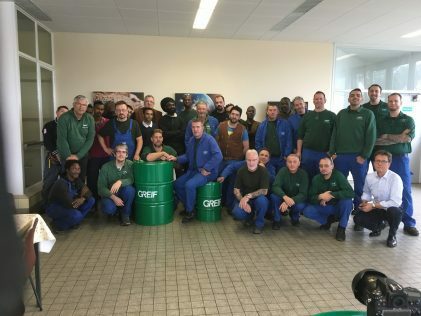 With over 13,000 employees at more than 200 locations situated across over 40 countries worldwide, Greif is a leading global supplier of industrial packaging solutions. Established over 140 years ago it has an annual revenue of $3.7 billion.